The last post about enVisionMATH and how I, as a math person and dad, go about trying to make sense of what my 6-year old brings home from first grade seems to have struck a chord among parents. The comments have been outstanding and there seems to be a real need for this kind of conversation. So I have a few more such posts coming up soon, starting with this one. “You can use a double to add a near double.” It gives: 4 + 5 and shows four blue balls and five green balls. “First double the 4”. It shows 4 + 4 = 8, and the four blue balls, and four of the green balls with the extra green ball sort of falling to the ground. And from there, in the fourth frame, one of the girls in the earlier frame concludes that 4 + 5 must be 9 because 8 and 1 more is 9. There’s a thing at the bottom asking kids to explain the process and then a bunch of near-double sums to practice — presumably kids are supposed to use the method described above, but there’s nothing forcing them to do so — and some “algebra” questions with blanks in the place of variables. I’m not sure exactly how my brain goes about adding near doubles — whether it just somehow does the addition in ways that are almost automatic thanks to 35 years of repetition, or whether there are little tricks it employs — but I am absolutely certain that I don’t do it the way enVisionMATH is telling kids how to do it. I tried it. When I read the worksheet, I thought about near-doubles that aren’t so easy, like 121 and 122. Quick! Add those together. Did you think, “122 is 121 plus one more; 121 + 121 = 242; 242 and 1 more is 243” ? I didn’t — not by a long shot. I just added the numbers together. No methods, no tricks; just old-school addition. There may be some tricks that my brain invokes to “just add the numbers” — for example, I tend to visualize the two terms of the sum stacked atop each other in the classic vertical arrangement for adding, and then visually add the digits — but I am most definitely not going through the four-step process on this worksheet. In fact, the four-step process complicates matters so much that it’s inexplicable why they are even bringing it up. Most kids at this stage can add 2 + 3 or 5 + 6 in one step. But by introducing this method, there are four operations: comparison (find the larger of the two near-doubles), subtraction (take 1 from the larger number), addition (add the two duplicates), and another addition (add 1 to the result). Technically there is a fifth operation kids have to perform, namely recognize that the two numbers they are adding are near-doubles in the first place. One might argue that doubling a number (in the third step) is easier than adding it to itself — kids just recognize that doubling 5 gives 10, for instance — and subtracting 1 is a very easy special case of subtraction in general that nearly everybody at this age can do without thinking, similarly for adding 1 at the end. That may be so, but it can’t be so much easier that adding in steps 1, 2 and 4 results in a net reduction in complexity or a net gain in conceptual understanding. But what about kids who can’t add two one-digit numbers together in one step? There are some of those out there, including probably a few in my daughter’s class. This method doesn’t help those kids. Again, we may argue that adding 4 + 5 is considerably harder than the combined process of comparison, subtracting 1 from 5, doubling 4, then adding 1. But I don’t think so. A four-step process is no less cognitively demanding than a single-step process, even if the four steps are easy. And besides, life does not throw near-doubles at you to add. How is a kid going to learn to add 2 + 5, or 2/5 + 7/8, or 123.38 and 99.99 this way? If there is some research that suggests that people really do add near doubles this way, I would love to see it. Otherwise it’s hard for me to believe that any more than a tiny fraction of the human population actually does it this way. Is there going to be some mind-blowingly cool way to do complicated arithmetic in one’s head farther down the road that uses this idea, like multiplying numbers that are near-squares or something? Perhaps I should be more patient. But for the time being, I told the 6-year old just to add the numbers together like she already knows how to do, the old-fashioned way. Thanks for continuing this series, Robert. I’m generally with you on this, but I wonder if I hadn’t learned how to add numbers the traditional way if my mind might make more use of these kinds of tricks today. For instance, when you used 121 and 122 as an example, I agreed that doubling 121 and adding 1 seems pretty roundabout. But then I thought, how would I mentally add 21 and 22? Might I double 21 and add 1? No, I’m pretty sure I would add the 20s to get 40, add the 1 and 2 to get 3, then add the 40 and 3 to get 43. That works great for me, but it does leverage lots of years of experience working with 10s columns and 1s columns. I don’t think my method is any simpler than the “near doubles” method. On the other hand, my method is a heckuva lot more generalizable than the “near doubles” method! As you point out, you don’t see a ton of near doubles in practice. I can only assume the point of this worksheet is not to help your daughter become more efficient at arithmetic. Given enVisionMATH’s fascination with recognizing pips on dice, I’m guessing there’s something here about connecting numerals with sets of objects. There are even pip configurations on the worksheet. Or perhaps there’s a pre-pre-algebra angle? The “near doubles” method seems to be gesturing at the fact that x + (x+1) = 2x+1. The “adding doubles” idea is an improvement compared to some of the other material you discussed from the program. The idea is very good. The performing of so many steps is not worth worrying, since, by practice, students will become able to do this kind of addition without consciously reviewing the steps at a low level. Actually, I used the same kind of process when I was young, and in fact, I did this for adding two-digit numbers. I do this sort of thing all the time when faced with a complicated expression where I can’t just “see” the result. I break it up into simpler pieces, and I think that’s what this really is about. The examples, using single digit numbers which are near doubles to boot, may be a little trivial but I think the intention is good enough. I can’t remember how I was taught basic arithmetic way back in the first grades, but I don’t think it was this way. I don’t think they used fancy visualisation methods back then. Still, this is the way that comes naturally to me. It is a method of reduction, basically; you reduce a “hard” calculation by one that is “easier”, that is either more elementary or better practiced. While I think this kind of method is valuable to learn/teach, it is silly to employ it on calculations that you should be able to execute ad-hoc. If you want to calculate 200+300, “near doubles” are no immediate help, but reducing it to (2+3)*100 works wonders — if you can add 2+3 quickly. You have to have a basis of well-practiced calculations in order to apply reduction successfully. Thanks for the comments so far. One of the reasons I’m doing these posts is to let other people enlighten me on all this , and so far it’s working. There’s no doubt that we all employ mental tricks to do arithmetic unless the arithmetic is simple. 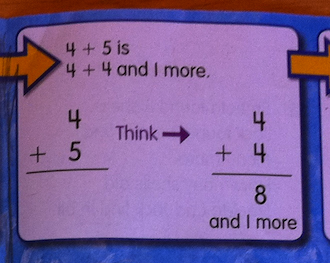 I think my point it: should we be teaching first-graders arithmetic tricks? Also, is it even *possible* to teach tricks, or are those tricks something we just spontaneously come up with the more we do regular arithmetic the old-fashioned way — as if the brain were routing around arithmetic by inventing tricks and seeking the minimal-resistance path? I have been taught no tricks in (elementary) school if I recall correctly; certainly not in the first two years. My father showed me some tricks (in particular “approximate and correct”) later and that helped a lot. Teaching basics first and then showing shortcuts would be my favorite didactic approach today, too. But I think that teaching like in your daughter’s book can work. It is a more organic approach and is not as fixed on learning stuff by heart. In the end the result matters; nobody will ask for the formally correct substracting algorithm you typically learn at school. I certainly agree that much too much time is spent on looking for these “creative ways” to teach Math vs. actually teaching it in the way that works. I’ve seen a number of worksheets from my kids school where the objectives did not really make sense. Instead of doing this nonsensical exercises, a much better way would be to give kids more intuition and better number sense. I’ve been trying to do this with mu daughter for a while now and it’s definitely starting to pay off. I think the problem with this kind of approach is that it is taught not as an intuition builder, but another rule to apply in the special circumstance of near doubles. I think you’re on the right track here. In What’s Math Got to Do with It?, Jo Boaler writes about the importance of being able to “decompose” numbers and work with them in flexible ways. Most of us do this all the time (see the way Derek described adding 121 and 122). In the early grades, students need to be encouraged to discover and share their own ways of working with numbers in this way. Teaching things like this only perpetuates the idea that mathematics is a set of rules that must be followed. I’m willing to bet the lesson Robert writes about here will lead some students to think that there’s a rule for adding “near doubles” that they must add to their lengthy list of rules for mathematics. Your comment should be elaborated, since you have some good sense about the difference between fundamentals and tricks. Instruction should focus less on tricks but should focus more on why the tricks work. Hmmmn. I have gotten a lot out of Ron Aharoni’s “Arithmetic for Parents.” I recommend it to you. One of his principles is “begin with the familiar”. So, if the students have mastered the concept of “doubling” given an oral prompt & have the other preconditions, the “doubling plus one” isn’t so awful. *the answer boxes for the two double-digit answers (problems 7 & 10) are the same size as the single-digit answers. It’s not so bad when the answer is 11 — most kids can manage. But when you get to 12, 13, etc — adds a handwriting degree of difficulty that’s possibly a distractor. *Has the curriculum yet tackled the concept of even vs. odd? If it has, find it peculiar that the exercise doesn’t talk about “next odd number” rather than “near double”. This approach could be extremely valuable to learning one digit additions. Generally 1+1, 2+2, 3+3, 4+4, and 5+5 come easier than some other sums (skip counting, evens, whatever). But for a child with partial knowledge of a 0-10 addition table, instead of four steps we have 2 and a half: recall, recall, add one (which is to say, recall, recall, count up). And this process can help fill in gaps in the chart, leading to the automaticity that we desire. Do you recall knowing 3+3 but not 3+4? It is hard to imagine, but children really are, briefly I hope, there. I am a first grade teacher and I use the envision curricula in my classroom. 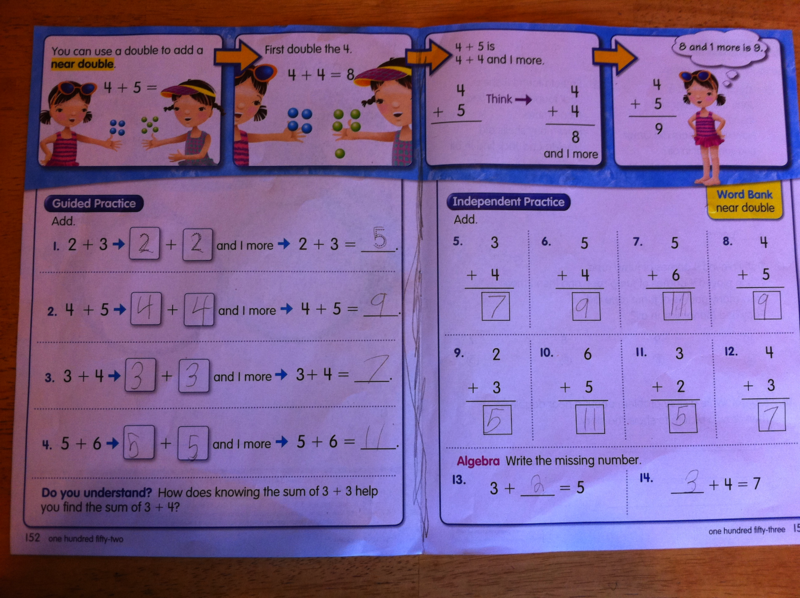 My students are actually doing the second grade math program in first grade and when I first began using the program I was very sceptical about its methods. I kept thinking, “we are confusing these children with all of the conceptual thinking behind simple processes”. Now having been using the curricula for over a year, my perspective has changed dramatically. Envision is attempting to create math THINKERS. It teaches them the strategies that good math minds use all of the time. The near doubles lesson is just one great (I’d say) example of how envision approaches math. It asks its students to put their fingers down, stop using all of the shortcuts that we (yes, myself included) we taught and to think “what is really happening here”. I think you are lucky to have your child at a school where they are encouraging her to think. When we ask our students to take the short cuts in math like adding on their fingers, “carrying the one” (which means absolutely nothing) and so many more, they might get the answers right but they take in zero lessons on problem solving and critical thinking. I think it is great to teach tricks, because it is a way to make math fun. I can teach you a cool tick for multiplying 5 times 7 in base 8, or 3 times 5 in base 6. A really cool style of trick that works in all base systems. I love tricks. However, I am concerned about creating bad cognitive habits. I want my students to know instantly what 2 + 3 is. I mean instantly. I don’t want them adding on their fingers, and I certainly don’t want them going in their head 2 + 2 = 4 + 1 = 5. That is an insane habit to take into adulthood and I would eschew any curriculum that might, accidentally, create that habit. I would teach these clever tricks only after totally insuring, through the use of flash card type tools, that the student can get the correct answer to basic arithmetic operations instantly in their head. I would teach these tricks at a higher age. I would use cuisenaire rods to reinforce what the basic concepts mean. I would stay away from worksheets with 6-year olds. The way to use a flash card correctly is to flash to the student 2 + 3 and if they do not instantly say five then you say five and move on. I do not think you are lucky to have your child using this curriculum. It appears to be doing the right thing at the wrong time and is at risk of creating a life long set of bad cognitive habits. I know, because I still use some of the bad habits I learned 43 years ago. Thanks for the post. I had to google to solve the answer to my son’s 1st grade math problem. We found the answer on your post. I joke that the reason I became an attorney is because I’m terrible at math. I was almost relieved to see my husband (with a masters in engineering and also the one who will always have to help the kids in math) also baffled at the concept of a near double. Why all of the extra steps? It just seems to complicate the equation.